No problem! This text is reproduced from my tutorial on Thingiverse, where you can download the STLs. The point of these objects is to help you to fine-tune the calibration on your delta printer to produce dimensionally-accurate parts. (Your printer is probably already close - this will help you get it all the way there.) Before doing this, you'll need to have your printer calibrated with, at a minimum, the GeneB 3-point method described in the Rostock MAX assembly manual. Any version will do. You should also have your extruder steps/mm calibrated - an imperfect process, but this process will compensate for any error in steps/mm. Dimensional accuracy is marginally important when printing statues and other knick-knacks, but if you want to print something that has to fit with something else, dimensional accuracy matters. It can also help if you have problems with larger prints failing after they've been running for awhile, particularly if they're failing because the hot end is knocking them around (scaling is too small), or you're getting delamination (scaling is too large). If you want to print parts that will be used to form the structural components of a 3D printer or some other machine, this is VERY, VERY important! On a delta robot, the scaling is directly influenced by the arm length setting in the firmware. If your parts are coming out too small, you need to tell the firmware that the arms are slightly shorter, so that it'll know that it has to push them a little bit farther to get the correct result. Likewise, if your parts are coming out too large, you need to tell the firmware that the arms are slightly longer, so that it'll know not to push them quite as far. You also have to calibrate the filament extrusion multiplier. If it's off, the part will be slightly "fatter" or "thinner" than it's supposed to be. That will be the first step we do. If your printer has auto-calibration firmware that can adjust the delta geometry variables - delta radius, tower radius and angle, etc. - it may have a feature that allows you to adjust the arm length automatically. At this time, I recommend against letting the firmware adjust the arm length. Let it adjust everything else, but not that. Repetier and Marlin have their own automatic calibration systems, but I haven't had good luck with either of them. I don't recommend anyone in the market to buy a new controller get anything Arduino-based, as they are not future-proof, and struggle just to keep up with the calculations required by a delta robot. Please note that using the "bed leveling" feature of firmware usually means that it's doing a height adjustment based on probing the bed. That's not the same as calibrating the printer, and is not particularly useful for anything we do here. You can leave it turned on if you need it, but when the instructions say to re-calibrate your printer, that doesn't refer to automatic bed leveling by itself. Two printed calibration boxes, one 50mm wide and the other 100mm wide, or as close to those numbers as possible. That will tell you that your printer is ready to produce some nice, dimensionally accurate prints. Use natural (uncolored) filament if you can. Surface quality tends to be highest. Colorants - especially ones that make the filament translucent - behave like contaminants, reducing the surface quality. Black filament is notorious for being stuffed with low-quality fillers, so avoid that if you can. Do NOT use specialty filaments such as carbon fiber, wood, metal fill, etc. Use the Outside Micrometer, not the calipers, to measure your filament in ten places, each at least a foot apart. Enter the measurements into a spreadsheet, and then take the average. Put that into your slicer for the filament diameter. The filament will want to curl because it cooled on a spool. If you pass the filament between the micrometer's jaws at an angle that directs the curvature towards either jaw, it may throw off the measurement, causing the filament to read thicker than it really is. Instead, hold the filament so that the curvature is at a 90 degree angle relative to the jaws. - Layer height: 0.1 - 0.2mm is fine, the shorter the better. Taller layers will be sloppier. - Extrusion multiplier: Start with a value between 0.9 and 1.0. Your slicer (I recommend KISSlicer) should produce a square, only one loop thick. It should have no top or bottom surface, and there should be no infill. Print this. After CAREFULLY separating the square from the print surface, use the Outside Micrometer to measure the thickness of the top few loops. If you measure the first few bottom layers, it'll probably make the reading artificially high, because the first few layers are usually a little bit squished. Focusing on the top few loops is better. Avoid the corners! The plastic is likely to be a little bit thicker there. I usually measure 1/3 of the way between the two corners, and then 2/3 of the way. That should give you eight measurements for the single-wall box, which you can then average. You should expect the numbers to be a little different in each place. Multi-out hot ends (E3D Chimera and Kraken) may distort the filament more than single-out hot ends (E3D Cyclops and v6, Diamond, Prometheus, regular J-head, etc) because every nozzle is offset from the center of the hot end. That offset can throw the calibration off a little bit. We're using the Outside Micrometer for this step because its ratcheting mechanism ensures that you're always putting exactly the same amount of force (which is very light) on the filament. Using the regular calipers is less precise. Measure the box in at least two spots on each side. Some will read higher, others lower. Avoid measuring close to the corners, where the filament will be slightly thicker. You want the average of all the points you measure to be the extrusion width you specified. If it's too thick, reduce the extrusion multiplier. You shouldn't need to go below 0.9. If it's too thin, increase the extrusion multiplier. I usually wind up with values around 0.9 to 0.93 with PLA, PETG and ABS. Two or three iterations of this print should get you dialed in. Once this step is complete, you're done with the Outside Micrometer and can set it aside. Use the Digital Calipers to measure the width of the 50mm box in several locations. Measure the box across the east-west and north-south directions. (We don't care how tall it is right now.) As stated above, avoid measuring right next to the corners, as well as the bottom 1mm or so, where the plastic may be a little thicker. You should get a number close to 50mm. Slice Step_3_-_100mm_Box.stl with the same settings as above. Print the box and measure it in several places, avoiding the corners and bottom layers. It should come out to about 100mm. Now, we'll figure out whether both boxes' scaling errors are about the same, or whether the scaling error is greater for the 100mm box than it is for the 50mm one. IMPORTANT: NEVER adjust the arm length and extrusion multiplier at the same time! Do only one at a time. If you try to do them both simultaneously, you won't know what is helping and what isn't. Engineers prefer to change as FEW variables as possible at once! Scaling error = average measured width / what the width should be. Scaling error same with both pieces: Arm length needs to be adjusted. Scaling error changes between both pieces: Extrusion multiplier needs to be adjusted. 50mm box: 49.9mm wide. 49.9/50 = 0.998. 100mm box: 99.8mm wide. 99.8/100 = 0.998. In this case, the scaling error is identical. In other words, the scaling error changes proportionally with the size, and we see twice as much at 100mm as we do at 50mm. That's because the printer thinks the arms are longer than they really are, and it isn't pushing them far enough. (Conversely, if the boxes averaged 50.1 and 100.2mm, it would be because the printer thinks the arms are shorter than they really are, and is pushing them too far.) Jump to 5A. 100mm box: 99.9mm wide. 99.9/100 = 0.999. 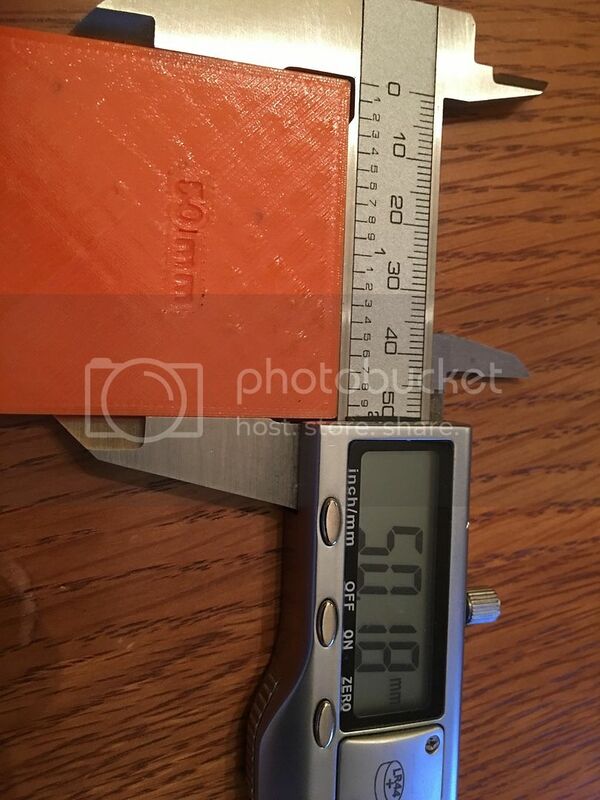 In this case, the scaling error is different on the 100mm box than it is on the 50mm box. They are both too small by 0.1mm, suggesting that the arms are fine, but that the extrusion multiplier is too low. Jump to 5B. After adjusting the arm length, you will need to re-calibrate the printer geometry, as by running GeneB's 3-point calibration, or using the auto-calibration feature in your firmware (assuming it has one). If the boxes were too narrow, increase the extrusion multiplier by 0.005 to 0.01. If they were too wide, decrease the extrusion multiplier by 0.005 to 0.01. Since the printer geometry settings haven't been touched, it's not necessary to re-calibrate the printer. You're only changing the extrusion multiplier in the slicer. Re-do Step 2 (print the 50mm box). Check it in several places with your calipers. If your calibration piece doesn't come out close enough to perfect, you can re-start the process. IMPORTANT: If you adjusted the extrusion multiplier, you will need to re-slice both boxes in Steps 2 and 3. However, if you leave that alone and only adjust the arm length, you don't have to re-slice them. It's very important to re-calculate the filament diameter, and then to re-do Step 1, every time you start using a new spool. Even if it's the *same exact color* from the *same exact manufacturer,* chances are good that the diameter will be a little different. Please leave a comment to let me know whether or not this calibration system works for you, and whether you have any comments about how to make it better! Good job on writing this up, a very good job! SO i did some calibration and that's what I got. What might be causing it? Last edited by jarekdadej on Mon May 02, 2016 11:50 pm, edited 1 time in total. jarekdadej wrote: SO i did some calibration and that's what I got. What might be causing it? Bad links is my guess. Sorry I"m a sarcastic #$%hole. FIxed the links but the problem is still there. Looks like it's working now! You realize that dimensional error is the size of 22 blood cells lined up side by side, right? 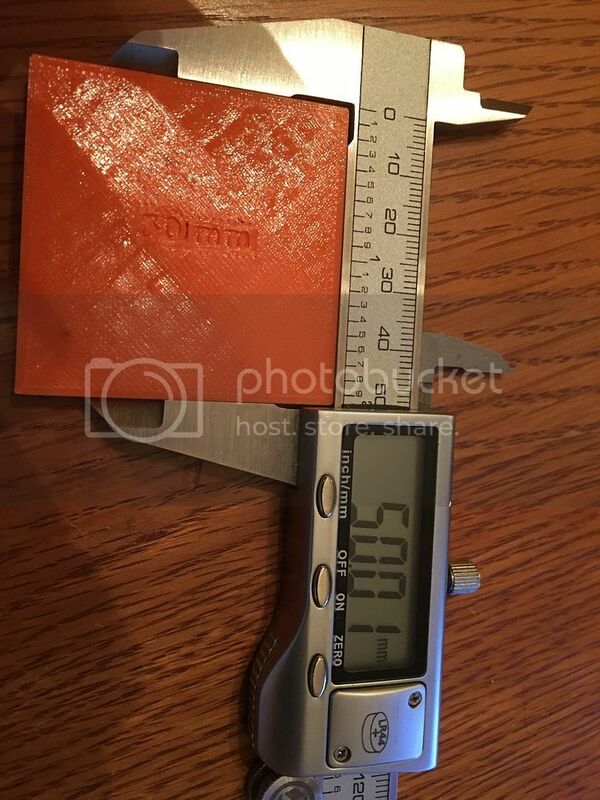 When you print a 25mm or 75mm test, is the error the same? I have a similar problem with my rostock V2. It is longer in the x direction than the y. Does your y measurement stay the same across the entire width of the cube? Mine gets smaller towards the right. It would be a very odd coincidence to have the same exact issue. Could be due to nozzle tilt. There are lots of places in a delta printer (or a Cartesian, for that matter) where error can creep into the build. Some Delta-specific issues: Towers leaning, towers being rotated a little bit about the vertical axes, carriages not facing the exact center of the printer but being off by 0.1 degree or whatever, arms having slightly different effective lengths (joint wear, manufacturing variance), etc. Any of these can take the effector out of parallel with the build surface. If you're using Trick Laser arms that have 100s to 1000s of hours on them, the joints may have worn unevenly. I don't know how fast SeeMe's new captive ball arms wear, but like Trick Laser, they are using ABS as a bearing interface material. I would not have made that choice, given what I know after having owned several sets of TL arms. What this all adds up to is that the effector is not exactly flat relative to the build surface, and that will cause the nozzle to experience a very small amount of rotation that will change according to effector location. The rotation is tiny, but when multiplied by the distance from effector to nozzle, it can be magnified. What were your measurements BEFORE you adjusted the arm length? I think I have it fixed now. The 50mm calibration box is now off by less than .05mm in the x and y directions. I think that is well within my margin of error for trying to line up calipers on layered plastic. I changed out both the carriages and the effector platform. My previous setup was the wooden style cheapskates, the V2 platform, and trick laser 300mm carbon fiber arms. I now have the injection molded carriages, the newest style effector, and the same arms. As mentioned earlier, I cut off the nubs that would have made the axle adapters sit at a funny angle to the platform. This new setup seems to have solved my issue, but I cannot say whether it was the cheapskates, the effector platform, or the way the arms were previously attached. I´m in the process to calibrate dimensional accuracy also. All is nearly perfect, but have one issue. Printed Boxes like 626pilot mentioned. One 30x30x10mm, 60x60x10mm, 90x90x10mm. All hollow. Wall thickness is 2mm. Walls are 2mm one the spot, height is on the spot. Printed now 6 of each. They are all the same within 0,01mm tolerance. My Delta build is very accurate. All angles are nearly perfect. Effector is parallel to the printbed. Arms are all within 0,05mm Tolerance. The measurements at the 6 points are rather off. On the upper right measurement I guess the wipe of the retraction tat takes place there could have influence, but what could be the reason for the difference between the right and the left wall to be off by more than 15% ? The right wall is spot on. Should I lower the flowrate even more? I have a flow rate of 0.95 in KISSlicer already, while the steps calibration with this same filament is spot on. DeltaCon wrote: The measurements at the 6 points are rather off. On the upper right measurement I guess the wipe of the retraction tat takes place there could have influence, but what could be the reason for the difference between the right and the left wall to be off by more than 15% ? The right wall is spot on. Should I lower the flowrate even more? I have a flow rate of 0.95 in KISSlicer already, while the steps calibration with this same filament is spot on. Could be effector tilt caused by minor misalignments in the frame, carriages, or arm joints. I never get exactly the same numbers everywhere on the single-wall box. It is tricky to get a delta printer perfectly square. Same question I asked the poster above you - how else are you calibrating, beyond my system? Very good and helpful calibration write up, thanks 626pilot. I think I have some "unsquareness" in my build indeed. I was afraid that there was something not right with my extruder, and that it outputs different amounts of plastic in different areas of the buildplate. If this is a result of tilt, I am probably fine with that. But since I have nothing to compare to except some near perfect pictures in this guide I am wondering if mys result is reasonable for having nice prints. Thanks 626pilot, I will try and I think I saw some slight adjustments in the armlength through OpenDACT indeed. But can you explan why that would change the thickness of a single wall? I understand that it can screw up dimensions of a 3 dimensional object, but for a 2 dimensional wall I would assume printtravelspeed and extrusionspeed are the parameters that matter. if the overall squareness is off a bit it could just be squishing down the nozzle further on those sides causing a wider wall thickness. Think I solved the Problem. Changed the Nozzle on my e3d V6 to a stainless steel one. Now I have it in Y-Direction only 0,03mm smaller. Hard to messure, but much better than before. That shows, that the old nozzle is not round not perfectly round or something inside must cause this problem. Anyone here who experienced the same with different nozzles? Anyway. This Tolerance is absolutly acceptable and more than I ever expected. Now I can print skates and effector for my magnetic ballarms with tolerances below 0,05mm - PERFECT! I mean, if my walls are thinner/thicker than expected then why mess with both variables? just leave extrusion multiplier to 1 and increase/decrease the filament diameter to fix that issue. That's how I do it, but my prints are far from perfect. I'm sure must be missing something obvious. Tincho85 wrote: Isn't changing extrusion multiplier the same as changing filament diameter? don't they modify the same thing? My thought exactly! But if you measure it correctly, it makes no sense to change the diameter setting, it makes more sense to change the multiplyer IMO, because there are more parameters influencing how much filament gets pushed.